It's inefficient, ages too quickly, and is out of sync with the strategic plan. No wonder so many executives hate toiling over the annual budget. 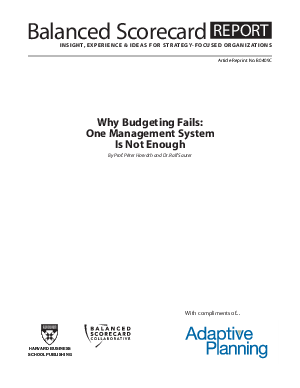 But, says Peter Horvath (Europe's leading authority on management accounting, controlling, and budgeting), don't look to the budget as the sole management system. Horvath and his associate Ralf Sauter describe six ways to fix budgeting, including integrating it with such systems as the Balanced Scorecard, so that it supports strategy execution in today's fast-changing environment.